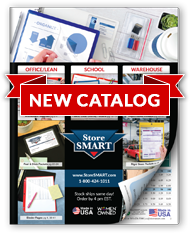 StoreSMART's Printed Executive LX Plastic Folders will certainly keep your paperwork neat—but they're also ideal for showing it off! With two crystal clear 8 ½" x 11" pockets on the front and back covers, your hard work will transition seamlessly from the office to the boardroom. Use the exterior pockets to house title pages or presentation outlines, and tuck your content inside to create effortless training packets, proposals, and news releases. Our Executive LX folders are constructed of 100% super polypropylene archival material to help protect your valuable documents, and unlike paper folders, they won't tear, wilt, dog-ear, or discolor. A professional business or medical environment demands professional materials. Don't settle for anything less—choose a folder that can stand up to the toughest treatment, and come out looking as fresh as your ideas. Our Executive LX Plastic Folders have been manufactured in the USA for over ten years. Inferior plastic folders can fall apart within the first few days of use—but we're proud to report that some of the first folders we created are still going strong! Students: Unlike paper folders, our LX Plastic Folders won't tear, wilt, dog-ear, or discolor. They always look fresh! Offices and Home: Our bright assortment of colors allows you to color-code your projects. Proposals: Our folders transition seamlessly from the office to the boardroom. Just insert your title page into the front pocket, and place your proposal inside. Training Programs: For effortless training packets, insert a title page into the front pocket and tuck your information inside. News Releases: Slip your release into the front pocket for a great first impression. Libraries and Archivists: Our folders are constructed of 100% super polypropylene archival material to help you protect your valuable documents. On the Road: Spills and fingerprints wipe right off. Outside Pockets: 8 ½" x 11" crystal clear pockets on the front and back covers. Inside Pockets: 4 ½" clear pockets on both sides. Business Card Holder: Slits on left pocket for your card or ID. Capacity: Holds 70 sheets per side. Made from archival poly plastic. Design features reinforced edges and built-in "stress guards" to prevent tearing. Stain-resistant—ink doesn't transfer to the folder. Your company's logo, motto, or copy can be printed on the cover. For artwork specifications, click here. After ordering, please email us your art files.